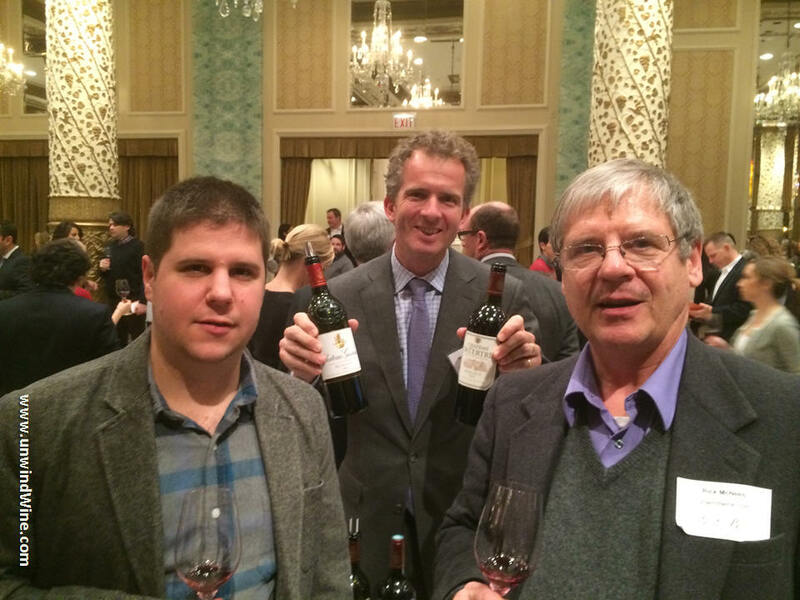 For Bordeaux lovers, one of the premier wine events of the year is the annual North American vintage release tour of the Union des Grands Crus de Bordeaux (UGCB). The UGC is an association of 133 grands crus producers from heralded Gironde estates. 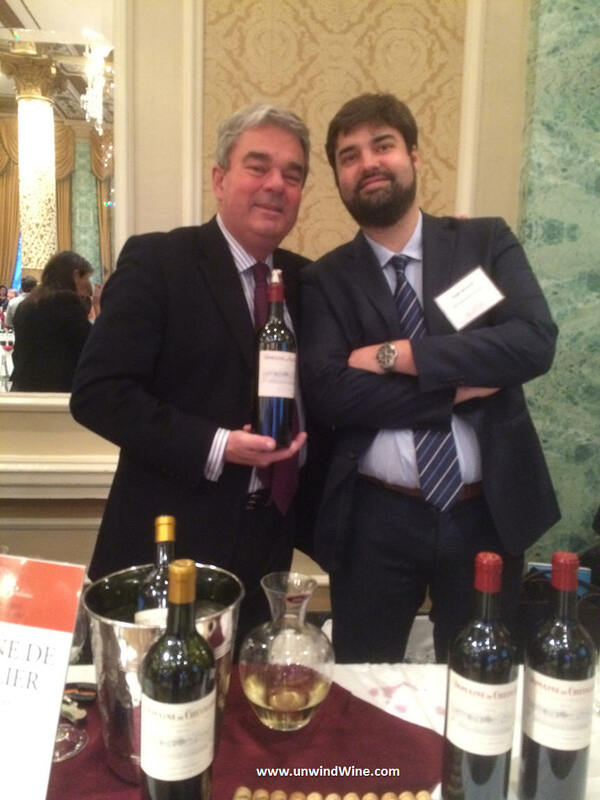 Shown below left is the colorful Bernard Olivier, Proprietor of Domaine Chevallier and President of the UGCB, with son Hugo. Wine enthusiasts will know that Grand Cru refers to the Bordeaux Wine Official Classification of 1855, where Grand Cru (French for 'great growth') is the classification that designates a vineyard (or producer) as reputable, known for its consistency in producing favorable wines. Grand Cru is the second highest rating of five levels, second only to Premier cru or Premier cru classé, the highest level of the five within the "Grand cru classé" designation for red wines, and the second-highest of three in the Sauternes appellation, where the highest is Premier Cru Supérieur (superior first growth). These highest rated wines are often known as or referred to as the classic 'First Growths', of which there are only six. The First Growths generally cost an order of magnitude more than the Grand Crus, beyond the budget of most, or certainly, only obtainable as once a year wines, or even once in a lifetime, special occasion wines. In top vintages, First Growths often cost more than a $1000 per bottle. 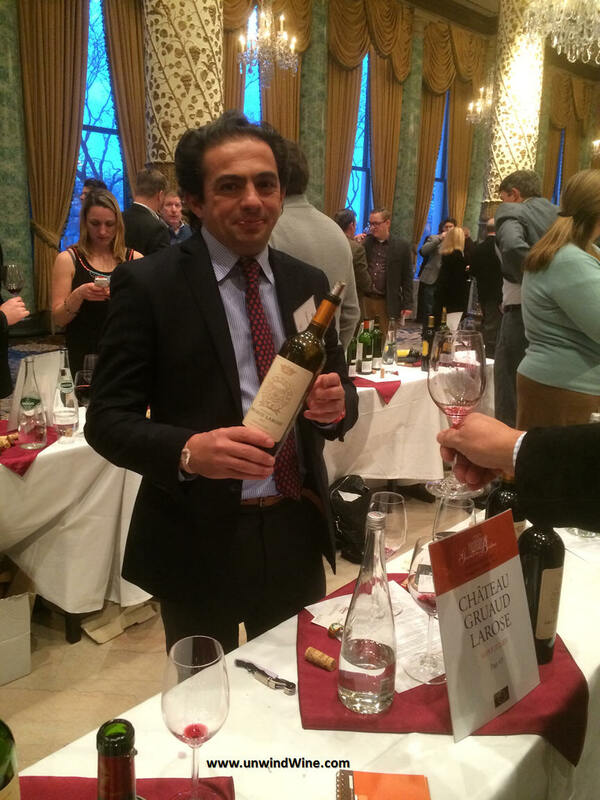 Often the Grand Crus wines approach the quality and rating of the higher classified and much more expensive First Growth wines, and are certainly indistinguishable, except to the most discriminating. 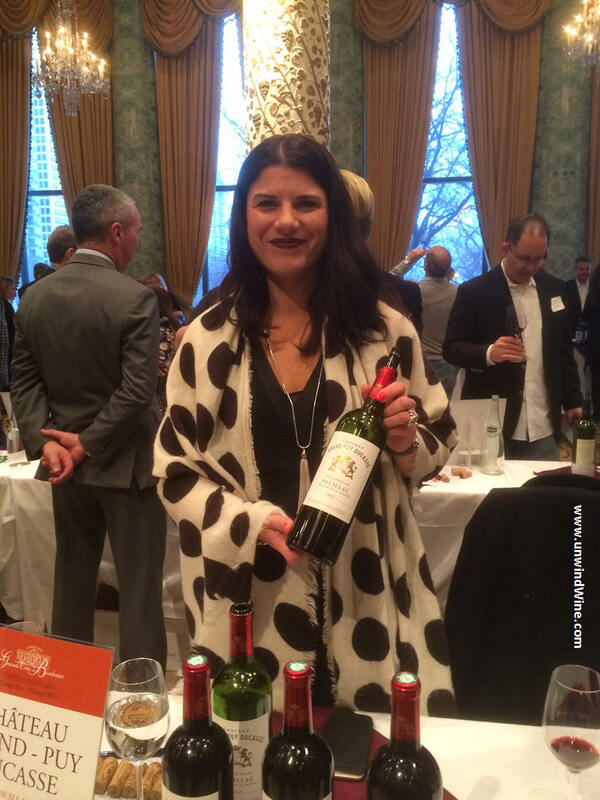 Hence, Grand Crus are the most popular and most widely collected wines for the masses of Bordeaux wine enthusiasts. 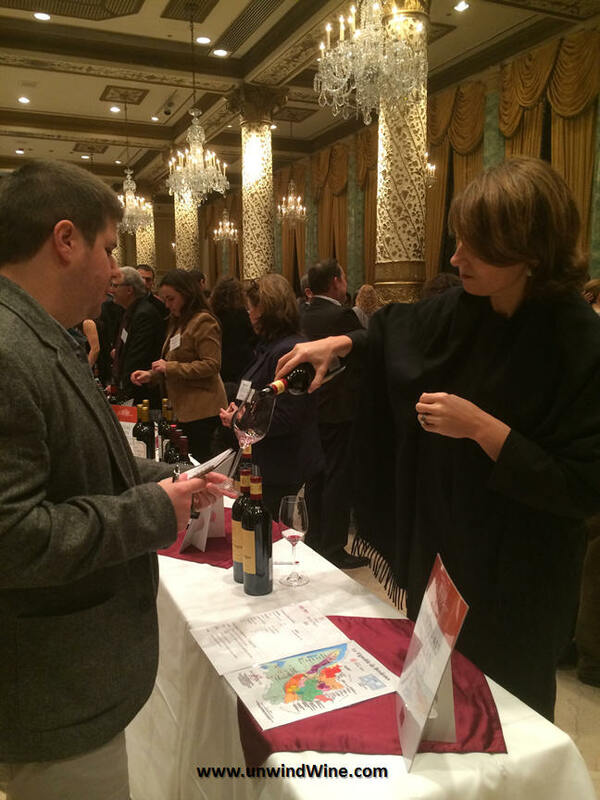 The annual UGCB vintage release tour event is open to the trade - restauranteurs, merchants, distributors, importers and the press during the day, and then it is open to the public in the evening through special arrangements with Binny's Beverage Depot, the Chicagoland wine super merchant with over thirty stores. Other featured merchants host the event in other cities. 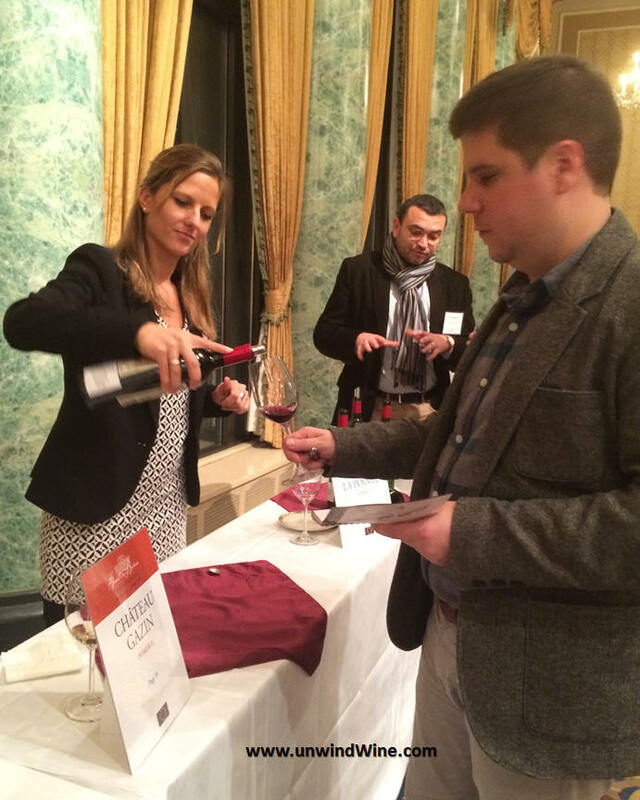 This outstanding event offers a rare opportunity to meet the producers and many of the actual winemakers and the opportunity to taste their latest Bordeaux release. 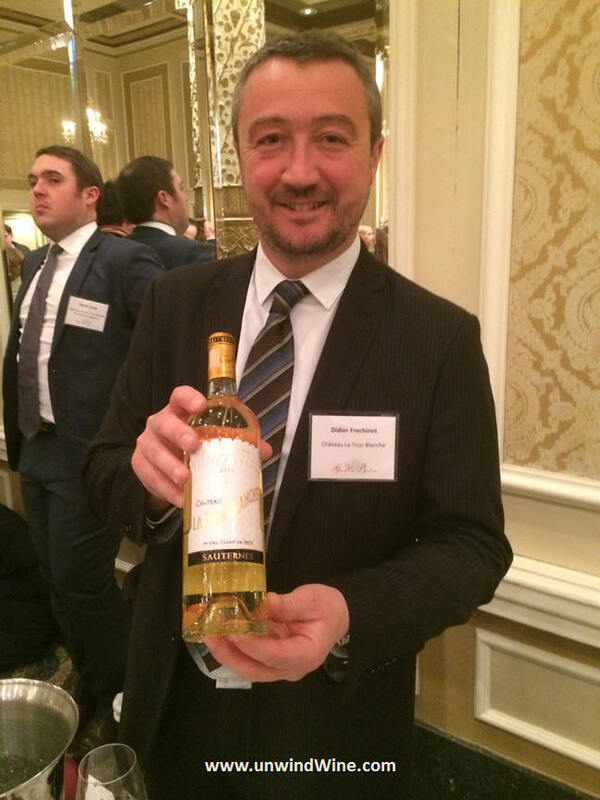 About 100 wines are presented for tasting and offered for pre-sale 'en premiere' or as wine futures to the public prior to actual availability of the wines in distribution. This provides a preview of the release and the opportunity to lock in an allocation of the wine at the pre-release price. For a collector seeking that release, it typically affords the best means to obtaining wines at early market price. The event provides enthusiasts and collectors the chance to meet and speak with the winery representative who offers unique insights and perspectives on the current vintage release, the recent harvest projecting next year's vintage release, as well as previous earlier vintages releases of the label. We hold many cases of Bordeaux wines dating back to the early eighties as well as many large format bottles of key vintages that we're holding for special occasions. The producers are exposed to these wines regularly and are a library of knowledge of the state of each release and how it is aging and drinking, even in the various size format bottles. They have vast knowledge and insights and can offer great perspectives on the historic vintages as well as the nuances of the current and upcoming releases. As with recent years, the tour visited New York, Chicago and San Francisco. The Chicago event was held in the classic famous Gold Coast Ballroom (shown left) of the chic Drake Hotel at the the corner where the Magnificent Mile North Michigan Avenue meets Lake Shore Drive. Like last year, when snowstorms in New York delayed the arrival of many producers in Chicago, a winter blizzard across the eastern third of the US threatened to disrupt the event, but a group of flight delayed courageous producers arrived from New York an hour before opening. 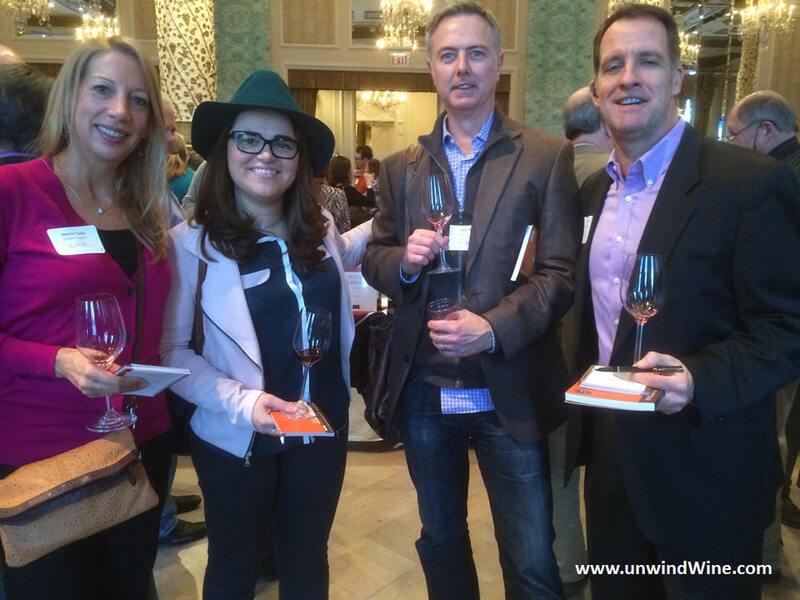 In fairness, naturally, I did not taste every wine, but of those tasted, here are the highlights of this year's event. 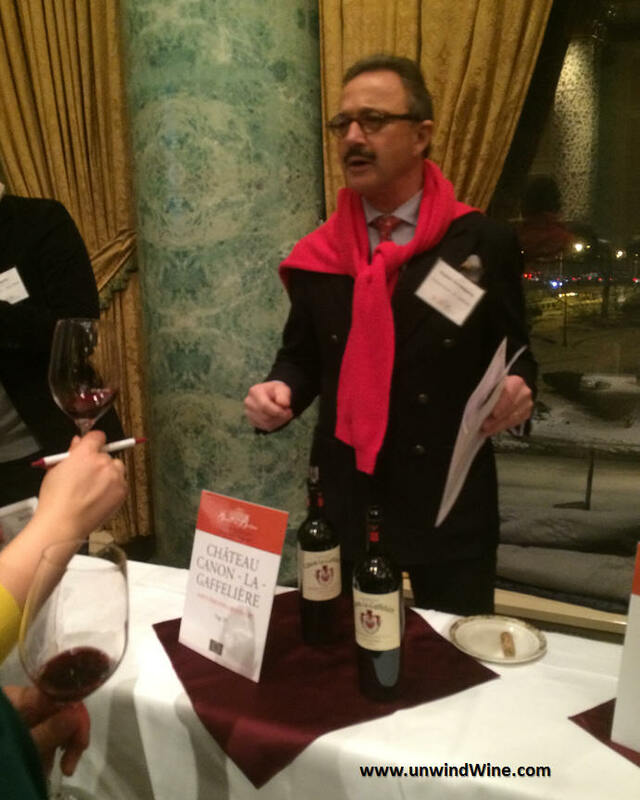 I focused on wines that I know and collect as a basis of comparison to calibrate the vintage. I then ventured to try some new wines, especially wines that are from producers I already know, and then I tried some new discoveries. Professional tasters, or those in the trade know the routine and rigor of tasting, but for the average person, they're not likely aware of the demands of such a tasting. 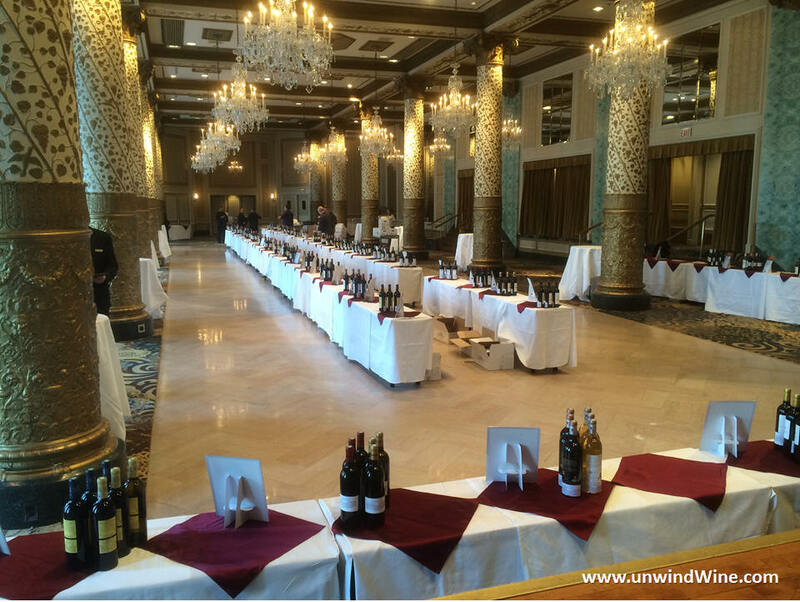 For such an event, with so many wines tasted, I'll rate them on a scale of 1 to 5 with 5 being the best. Tasting so many wines in one setting, I admit I succumb to palette fatigue and start to lose my sense of discrimination, so I won't try to rate on the more precise 100 point scale that is so often used. Also, note I didn't drink any wine, rather spit out the wine tasted, so my diminution of discrimination was not due to alcohol. Lastly, I did endeavor to occasionally cleanse my palette with water, bread and cheese, and while this helps immensely, I believe my olfactory senses ebb and flow over the course of the day as a result. The 2012 will not be a blockbuster vintage, like the 2010, or 2009, but with careful selection, will provide pleasurable drinking at more affordable prices. The wines should show to be more approachable at an earlier age as well. 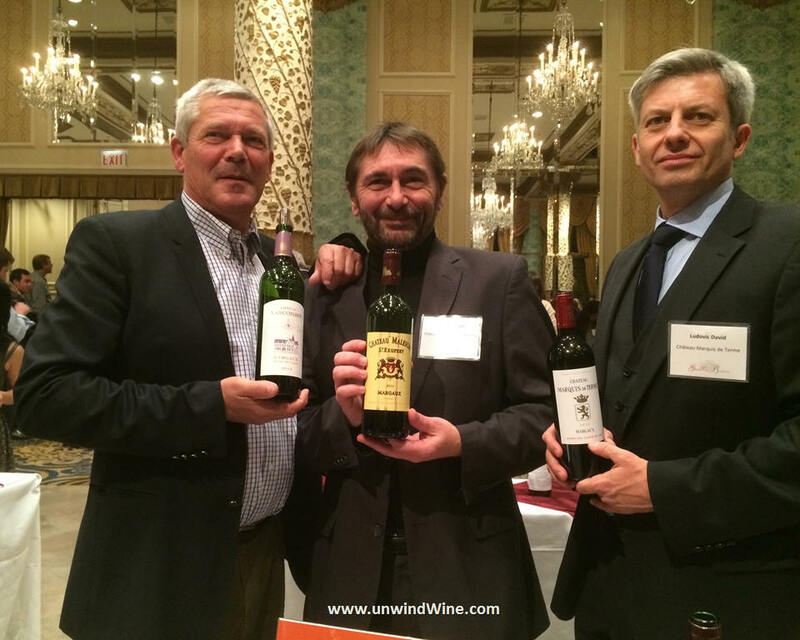 The stand out appellations that seemed to be high performing appeared to be wines from the Pauillac Appellation followed by Margaux, and then St Julien. 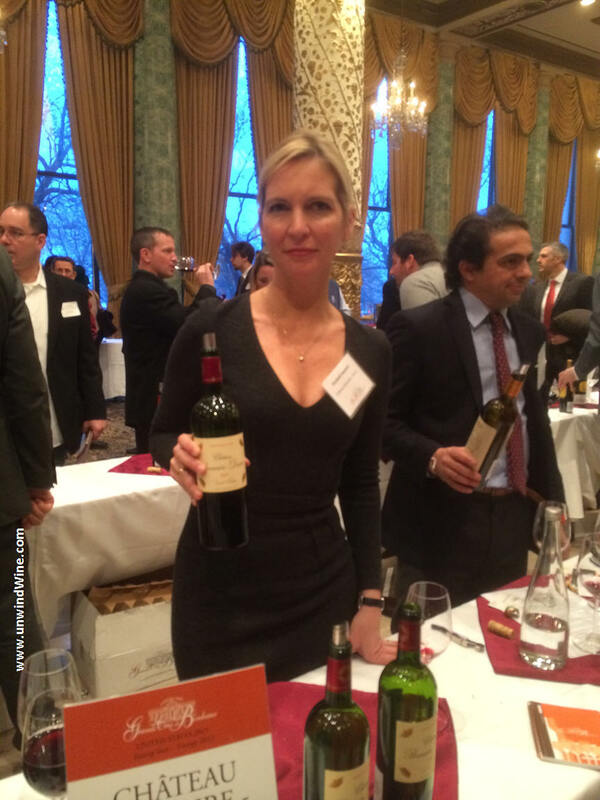 The Pauillac appellation seemed to not only be showing the best results for the vintage but also seemed to be most consistent amongst the group of producers represented. All showed full body, complex concentrated forward dark fruits, very structured with a firm tannic backbone on the long finish. Margaux seemed to show well however it seemed to lack the consistency of the Pauillacs. St Julien is one of our favorite appellations and most widely held in our cellar. Medium bodied, core of concentrated dark fruits, tones of cedar, tobacco leaf and leather, with moderate tannins. 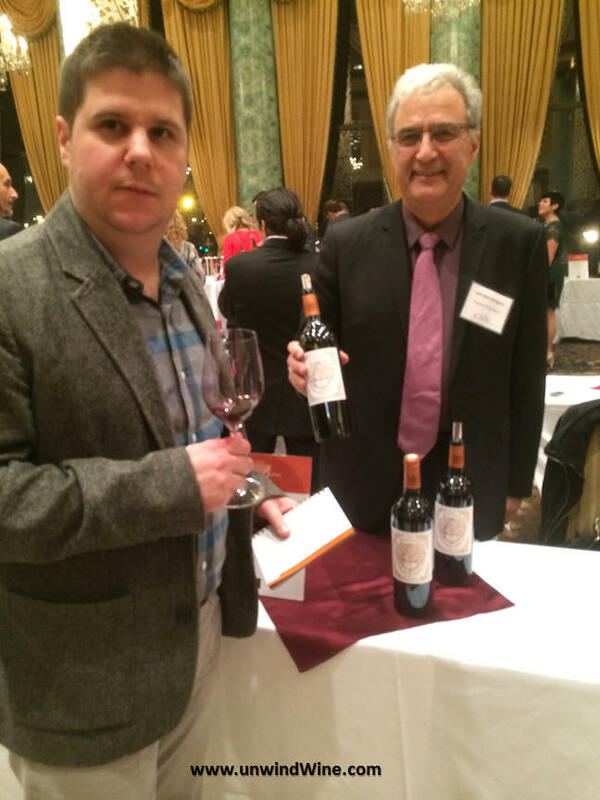 A new discovery of the tasting was Chateau St Pierre from the same ownership as Chateau Gloria. I've had this a couple times but never in a setting to compare to other benchmark appellation producers. Several of the Right Bank St Emilion and Pomerol appellation Merlot based wines seemed to come across a bit austere and slightly astringent with a woody and green cedar tone. Again, as with last year, Chateau Clinet (left) was a standout of the event and certainly of the Right Bank selections. 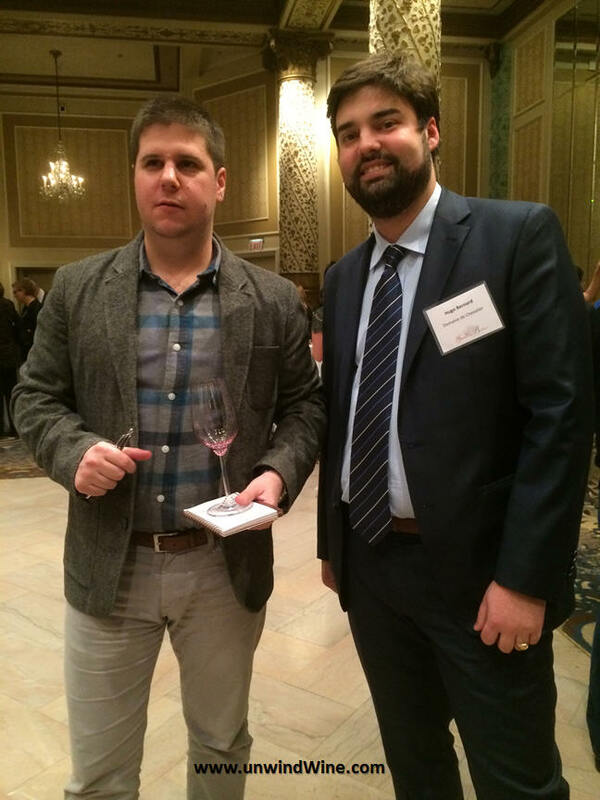 The next generation - son Ryan McNees, collector and enthusiast, and Hugo Olivier of Domaine Chevalier.